The Monkey Bible Show is an on-stage live musical/video show “experience” that takes the audience on a wild magic carpet ride and delves into the attic of our hearts and minds fusing evolution, religion, eco-conservation, and boldly challenges what it means to be human and not-so-human in this refreshing new perspective. The Monkey Bible Show is evolving. 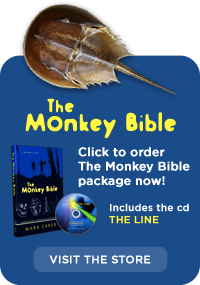 The first release of it is called The Monkey Bible Live! and it is ready now (!!!) to entertain, educate, and challenge your congregation, school, or event. Watch preview now!